The mass expulsion this week of some 130 Russian diplomats by Britain, the United States and other NATO allies is but the latest step in a long campaign to criminalize Russia. Like past ruses to demonize Russia, this latest effort will also fail. Because they are based on lies and deception. However, it is absolutely reprehensible that these anti-Russian states are ramping up international tensions by trampling all over legal and diplomatic norms with wild, unsubstantiated accusations against Moscow. 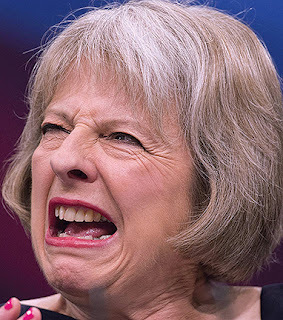 On the back of British claims that Russia was somehow involved in a murder plot against a former Russian spy living in England, and his daughter, a whole host of NATO and European Union member states have compounded diplomatic sanctions against Moscow. This is far more dangerous than the old Cold War. Because the erosion of legal and diplomatic norms by the US-led NATO powers are making repercussions unpredictable and unrestrained. 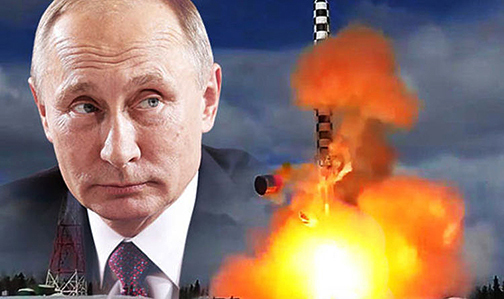 The whole affair is bizarre beyond words; yet, largely at the behest of the British government, international relations with Russia have been plunged into dire condition. Russia is being condemned without any evidence or due process. This is a dangerous anti-Russia witch-hunt conducted on a global scale. 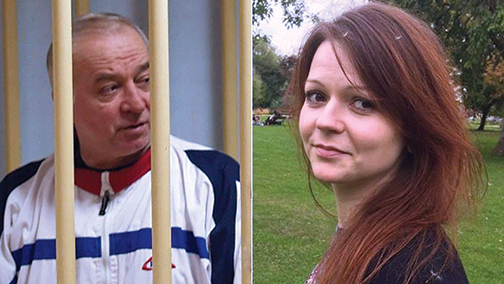 This week, the British government published a six-page briefing on the March 4 incident in Salisbury, where Sergei Skripal (66) and his 33-year-old daughter Yulia were apparently exposed to a nerve poison. The briefing issued by London was the basis for some 25 other states joining in the campaign to expel Russian diplomats from their territories, and to echo British accusations that Moscow is guilty of an assassination attempt. Any objective reading of Britain’s so-called “intelligence briefing” could only elicit a response of contempt and derision. It is but a superficial sketch, containing errors and based on the usual tenuous innuendo and assertion that the British government has been proffering since the March 4 incident. There is no verifiable proof to support the very grave allegations Britain is making against Russia. Yet this risible “briefing” is the supposed basis for an international campaign to criminalize Russia. One assertion in the briefing is that British scientists at top-secret chemical warfare laboratories at Porton Down – eight miles from Salisbury – “positively identified military-grade Novichok”. The latter chemical is reputedly a potent nerve toxin. 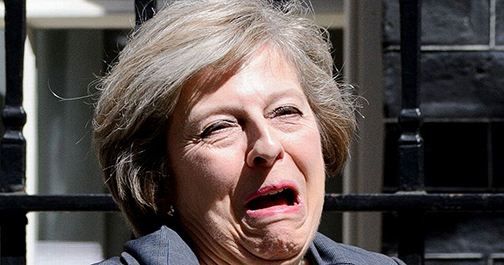 Another British government assertion is that “Novichok is a group of nerve agents developed only [sic] by Russia”. That last assertion is patently false. Any number of states could synthesize the organophosphate compound whose chemical formula has been publicly known for years. 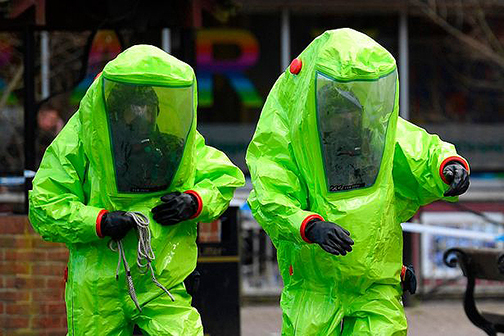 If the British scientists positively identified Novichok, as is claimed, then they must have had a standard sample of the chemical in their possession in order to conduct an analysis. If so, that then contradicts the assertion that Russia is the only source of such a chemical – a claim which Moscow, in any case, categorically denies. There are many other flaws in the British briefing which render the document a joke on legal standards. Preposterously, this travesty is being used to mount an international campaign to condemn Russia with far-reaching repercussions for global peace. 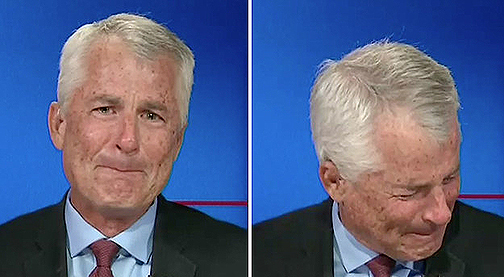 CNN fake news joins the anti-Russia circus, deploying their psycho CIA crybaby Phil Mudd: "I just know the Russians did it!" Let’s deal with some facts, instead of being railroaded by official British assertions and claims for which they do not permit independent verification. The fact is that a Russian citizen, Yulia Skripal, is detained in England, supposedly in a hospital, along with her British naturalized father. The Skripal family relatives in Russia have reportedly not been given any information by the British authorities on Yulia’s exact condition. Nearly four weeks after the alleged incident on March 4, the Russian authorities have still not been given consular access to one of its citizens who is being de facto detained on British soil. That is a gross violation of the Vienna Convention governing consular rights. More sinisterly, it is the British authorities who should be held responsible for any ill-fate of Yulia and her father. The campaign to convict Russia over an alleged assassination plot relies entirely on the say-so of British authorities who neither present evidence nor permit independent verification of their claims. That is an outrageous arrogance and abuse of legal norms by the British state. Compounding the mockery of due process, the British government’s briefing this week launched into a tangential litany of other alleged “Russian malign activity”. Russia was accused of “assassinating Alexander Litvinenko in 2006” – another former spy apparently poisoned on British territory. 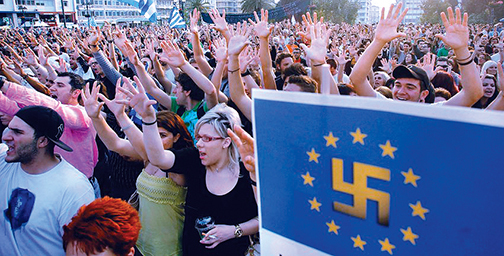 That case is far from proven, relying again solely on official British claims. Other outlandish, indeed slanderous, British accusations included Russia “shooting down” a Malaysian airliner over Ukraine in 2014; interfering in the US elections; cyberattacks on Germany, Denmark, Estonia and Britain; “occupation of Crimea in February [sic] 2014”; and “invasion of Georgia in 2008”. All these claims have been rigorously denied or disproven by Russia. It is staggering that the British government in a supposed “intelligence briefing” could cite these hackneyed claims as somehow lending substantiation to the bizarre poisoning incident related to the Skripals. It is truly astounding, not to say perplexing, that international law and diplomatic norms are being so brutalized on the basis of brazen lies and incompetence. The British authorities claim that one of their “measured and proportionate responses” to their insane accusations against Russia is the “dismantling of the network of Russian intelligence operatives in the UK”. That is tantamount to a self-license for more British transgressions. British Prime Minister Theresa May also this week in a phone call with US President Donald Trump reportedly discussed drawing up more sanctions on Russia to eject “spy networks” from their respective countries. "Help Donald! Our frame-up is falling apart!" So, Russian diplomats are being re-defined as “spies”. Again, this is self-license for more provocations, and, worse, the erosion of diplomatic channels for possible correction. What this amounts to is a new, unfettered phase in American, British and NATO efforts to criminalize Russia. Criminalization run amok. Is there any limit to the insanity? No, disturbingly, this is a subjective tailspin with no limit – until a head-on crash. The list of “malign activity” cited above in the British briefing are all past examples of NATO information warfare – or more bluntly, propaganda lies and falsehoods. Those efforts have failed in their objective to subjugate and cow Russia into submission towards US and NATO dominance. Russia’s military intervention in Syria to nullify NATO’s dirty covert war for regime change against the Assad government is perhaps the clearest demonstration of Russia’s effective defiance. Out of frustrated failure to defeat Russia through demonization, the information warfare has been wantonly stepped up in attempts to criminalize Moscow and President Vladimir Putin. Britain and its allies assert “there can be no other plausible explanation” for the poisoning of the Skripals other than Russian culpability. Wrong. 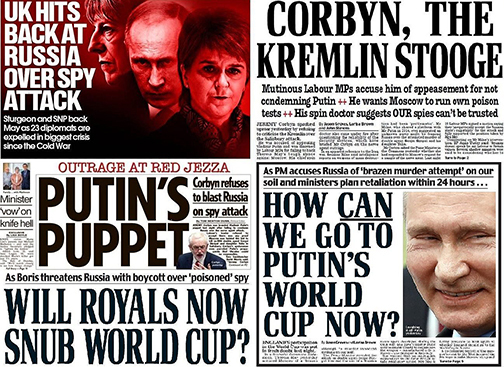 A far more plausible explanation is that Britain and its allies are engaged in a scurrilous, illegal campaign to criminalize Russia. Britain likes to claim a noble heritage of democratic politics, philosophy and law. Arguably, the British are entitled to that claim. There again, the British also have a more dubious heritage of piracy and state-sponsored skulduggery. This latter tradition seems more on display in the new and much more dangerous Cold War against Russia.